I didn't bother with solar because there is so little energy being produced from it. See Figures 2 and 3 to make sense of Figure 1. As an engineer who also has as a hobby, blogging on energy issues, I live, and breath graphs but these were tough to wrap my head around. I suspect very few energy pundits or peanut gallery commenters out there are going to successfully wrap their heads around them. So, when they pretend to understand them and begin to level nonsensical critiques, readers who also don't understand them will assume the pundit does, and take his or her word for it. Although the article has a link to the PDF of the study, the graphs in the article can't be scaled up enough to read. You have to go to the PDF to see the details. I've recreated them here in a format that you can see. Just click on one to initiate a higher resolution slideshow. According to Bloomberg New Energy Finance, governments and private investors spent about as much — $2 trillion — deploying solar panels and wind turbines over the last decade as was spent building nuclear plants over the last 54 years. As a result, additions of solar and wind to electric grids in recent years outpaced additions of all other sources of electricity including coal, natural gas, and nuclear. What has been the impact of all that new solar and wind on reducing emissions? Very little, according to a new Environmental Progress report, "The Power to Decarbonize," which looked at 68 countries since 1965. But the analysis [by the Breakthrough Institute] concluded that what mattered most was “standardization, economies of scale, rapid construction and quick installation” of nuclear plants. KEPCO built nuclear, for example. 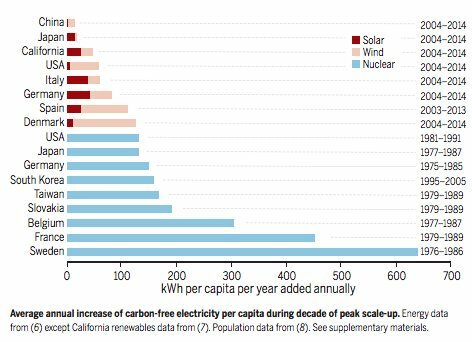 Advisor, James Hansen, published a bar chart of “Average annual increase of carbon-free electricity per-capita during decade of peak scale-up” in Science in August last year. (See Figure II 4.) That chart used more recent data than Russell and, generously, combined solar and wind into a single bar. But even then the chart showed the peak deployment of nuclear was up to 12 times faster than the peak deployment of solar and wind. And keep in mind that correlation does not imply causation. Had the study found the opposite, I'd have been one of the first to point that out. All the same, we are also seeing similar bad news trends for retail rates in countries with a high percentage of wind and solar. Wind and solar are caught between unsupportive correlation trends for both emissions and cost. What next?